Game Dinner Tickets on Sale Now! Our Game Dinner Tickets are on sale NOW. Check out www.catchcrooks.com/game-dinner to order before it’s to late. Please come out and join us at this educational FREE event. Wondering what to do for Dinner? Join us for All You Can Eat Pasta! Tonight is the last night of our All You Can Eat Pasta Nights at Riverside Sportsman Club. For only $8 you get salad, pasta and rolls and a portion of the proceeds go to supporting Crime Stoppers programming. The Event Management Program at St. Clair College, together with Windsor & Essex County Crime Stoppers will be providing a fun learning opportunity tomorrow, July 18th at the Student Life Centre at St. Clair College between 10:00 a.m. until 2:00 p.m. The event will be a showcase of the Crime Stoppers program, how it really works and how you can make your community a safer and healthier place to live. A Crime Stoppers Police Coordinator will be hosting an interactive presentation at 10:15 a.m. and 11:50 a.m. This is a free event, sponsored and produced by the Event Management Program, and is open to the general public. There will be carnival type games, activities, live entertainment and free food. Crime Stoppers is currently running its Fentanyl Awareness Campaign, anyone who has information on persons trafficking Fentanyl in Windsor and Essex County and wish to remain anonymous are asked to contact Crime Stoppers at 519-258-8477 or submit a tip online at www.catchcrooks.com. 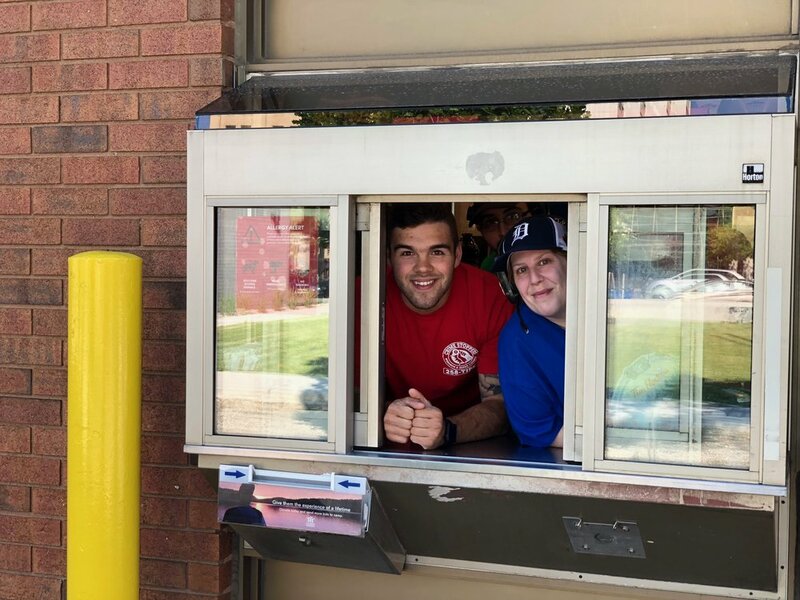 We are out at Tim Hortons today supporting Camp Day! 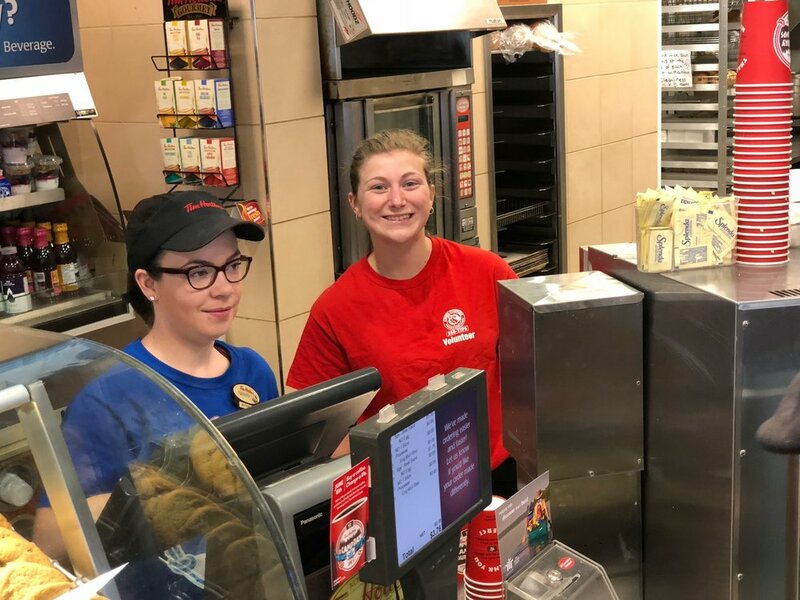 Volunteers are helping with fun activities, serving food and drinks and working along side campers as they share their stories. Crime Stoppers is at L'Essor Secondary School this evening. We are particpating in a community forum to discuss substance use among adolescents within our community. In association with the Town of Lakeshore the Lakeshore Ontario Provincial Police (OPP), Crime Stoppers and Lakeshore Community Policing Committee (LCPC) is holding a DRUG AWARENESS CLINIC at the Atlas Tube Centre 447 Renaud Line, Lakeshore, Ontario on May 1st between 6:00 p.m. – 8:30pm. A number of speakers will be in attendance offering advice and guidance to those who may have been affected, educating those interested and speaking of illicit drugs prevalent in our communities. It’s a beautiful morning out at Point Pelee! Getting ready for the 11th Running of the Southern Footprints Race at 9am! As part of Devonshire Malls ACT recycling day, bring your shredding and unwanted or expired medication to Devonshire Mall, back parking lot for disposal. Just $8 a box for shredding, free to drop off medicine. We are here until 5pm. We are going to be setup at the 2018 Big Buck Sportmen's Show to promote our program and the 2019 Game Dinner! 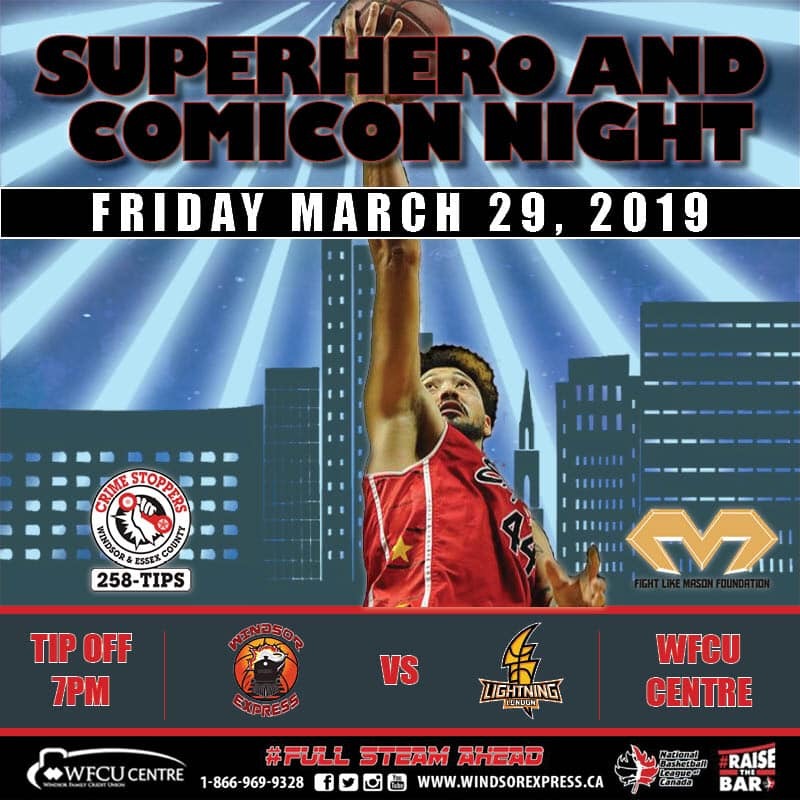 Stop by our booth, grab some cool Crime Stoppers swag and enter for a chance to win your 2019 Game Dinner Tickets. And remember to Save the Date for February 22nd, 2019! 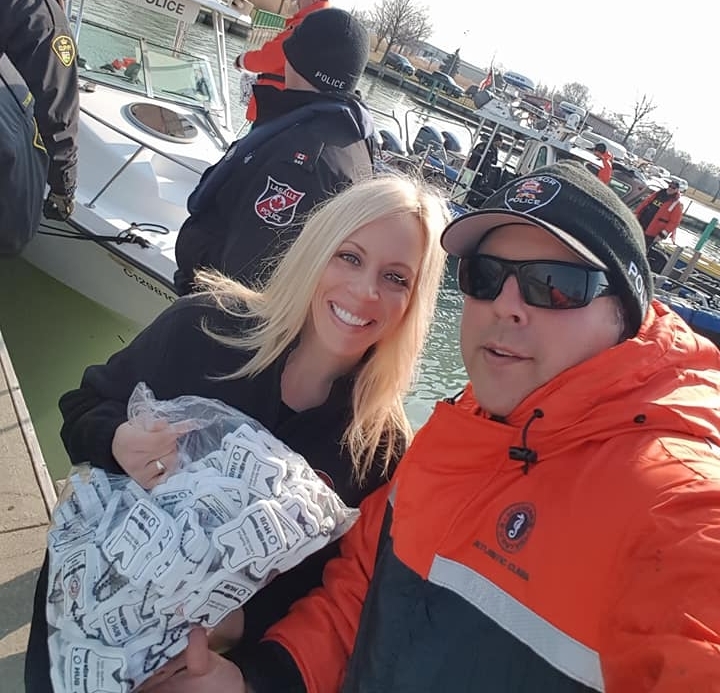 The police in partnership with Crime Stoppers launched the local marine boating season today! Report suspicious activity on our waters!! Call Crime Stoppers to remain anonymous. 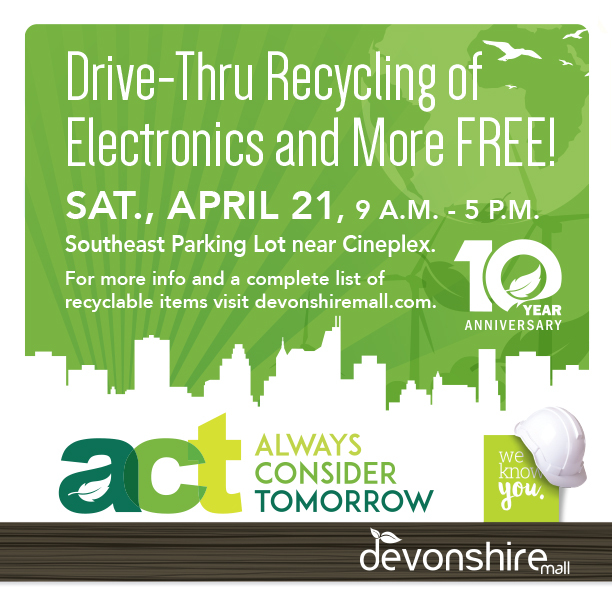 Join us at Devonshire Mall next weekend, April 21st, for the 10th Anniversary of their ACT Recycling Day. Full details about the event can be found here. Crime Stoppers will be on sight, together with First Stop Services, to take your unwanted or expired medication and shredding. Wednesday, April 5th, we spent the day at St. Clair College recruiting new volunteers! Thanks to everyone who stopped by and signed up to get information on how to become involved! If you are interested in becoming a Crime Stoppers volunteer, check out our volunteer page. What an amazing season it’s been this year! Huge thanks to all of our awesome volunteers for helping make this the best Chuck a Puck season ever! 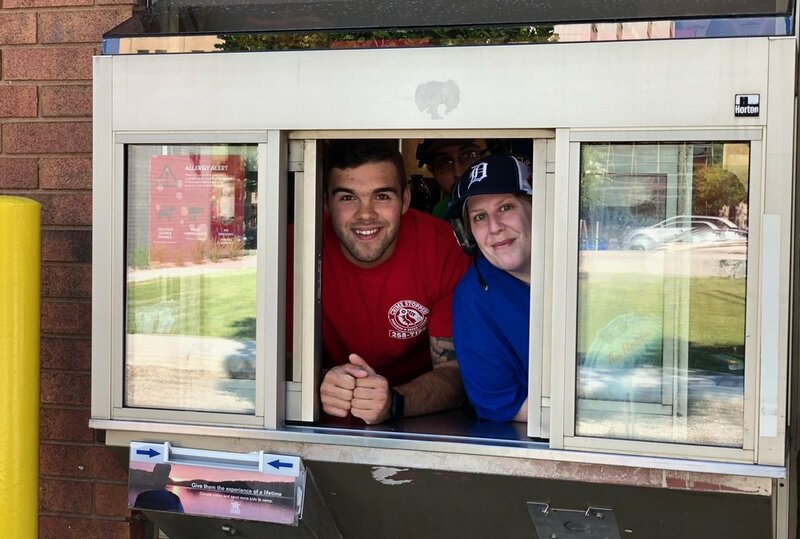 Board Member Lina is helping Program Manager Tyler to get in the spirit while giving her time with our volunteers prepping for Spitfires Chuck a Puck.